WELCOME Thanks for considering Douglasville as a place to operate your business. The City of Douglasville is dedicated to maintaining a user-friendly approach to the licensing and permitting process. We strive to make the experience of starting your business as simple as possible while upholding our commitment to property the aesthetic and economic well-being of the City of Douglasville. We are excited that you are considering investing in our community! 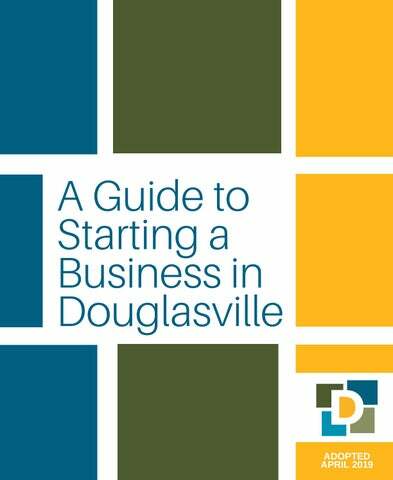 This guide is a resource for business owners and entrepreneurs in the City of Douglasville. While it certainly does not answer all of the questions you are sure to have, it does provide information on who can answer those questions. By following our simplified A-B-C-D process, it is our hope that you find this guide full of information for what you will need to know to establish a business in the City of Douglasville. A --- Appropriate Zoning B --- Building Permits and Inspections C --- Occupational Tax Certificate D --- Doing business in Douglasville If we can assist you in any other matter regarding locating and operating your business, please contact April McKown, Economic Development Manager at (678) 449-3102 or email at mckowna@douglasvillega.gov. EXISTING STRUCTURE Step One: Once you have a tentative location for your business, contact the zoning division to determine permitted uses of that location. Please have your site address (preferred) and/or parcel number ready when speaking with the Zoning division so that they may assess your site properly. Do not invest any money in a location until you know the location is properly zoned for your proposed use. This includes leasing the property before a zoning verification has been made. The Zoning Administrator can help you determine if your location and type of business are in compliance with the City of Douglasvilleâ&#x20AC;&#x2122;s Zoning Ordinance. The Zoning Administrator can also answer any questions you may have regarding signage. Step Two: After determining that you are in compliance with the zoning ordinance, the zoning administrator will approve your zoning verification request to you so that you may obtain your business license. NEW CONSTRUCTION Step One: If you are constructing a site from the ground up, you will need to submit a development plan and application form. The application form is available at www.douglasvillega.gov . Click on the Community Development Tab and click on documents under Planning and Zoning. Here you will find the direct link for the Development Plan Application. Step Two: Upon submission, you will be required to submit 1 copy of the site plan no larger than 11X17 and 1 color copy of building elevations identifying faĂ§ade materials by percentages no larger than 11X17. Step Three: Once you have a fully approved Development Plan, you will submit your civil plans and land disturbance plans for review and approval by staff, prior to beginning work on the property. If you have any questions regarding the above information, please contact the Community Development department directly at (678) 449-3230 or by email at ask-cd@douglasvillega.gov We are happy to walk you through the process. BUILDING PERMITS Any changes to the exterior or interior of an existing building may require a permit. Permits are REQUIRED before any work begins. Fees are based on the type and extent of work. Items that require a permit include: - Interior finishes - Modifications - Additions - Remodeling - Structural Repairs - Siding (type of siding must be approved by zoning) - Windows - Water heaters - Gas, sewer, and water lines - Irrigation systems - Heating appliances - Central air conditioning - Vent dampers and flue pipes - Solar heating systems (must have a letter from a structural engineer) - Electrical distribution panels - Upgraded electrical service (including low voltage systems) Electrical permits may be required for the modification to the existing electrical system. Plumbing permits may be required for the modification to the existing plumbing system. HVAC permits may be required for the modification to the existing HVAC system. The State of Georgia requires that all contractors be licensed in order to perform contracted work. If you would like to verify that your contractor is licensed, the Building division will gladly assist you. If you have any questions regarding building permits and inspections, please contact our Community Development Department at (678) 449-3230 or by email at ask-cd@douglasvillega.gov. Step 1: Do you need a permit? Building permits are not required if your project is: • Less than 100 square feet • Painting • Installing floor covering • Re-roofing • Replacing exterior siding • Sidewalk or driveway • Swimming pool less than 24 inches deep Step 2: Site Information: Before you can obtain the appropriate approval or permit, the following will be required: • Obtain a Zoning Verification Letter from the Zoning Division. • You may be required to submit additional documentation. These may range from commercial civil plans to architectural plans to trade (electrical, mechanical, plumbing) plans. These required submittals will be known during your initial contact with the Building Division. Step 3: Are there any special approvals that will be needed for your project? In some cases, there may be an additional level of review on a set of plans to determine if they are requiring an additional reviews for approval. These could include ensuring that there is no deviation from the City’s Zoning Code that would require further approvals related to such areas as setbacks, density limits, or building façade requirements. Please note that the City of Douglasville does not review water and sewer plans. This will be a separate area of review conducted by the Douglasville-Douglas County Water and Sewer Authority. Step 4: Plan review The City must next review the submitted plans, Here is what to keep in mind: • Submit all necessary maps, construction documents and plans according to the requirements of the Project Submittal Manual and in conformance with any approved discretionary action on the project site. • Ensure that you submit all the required plans, drawings, maps, studies, and other materials specific to the approval(s) you need. • The City makes every effort to have these plans reviewed in a timely manner and usually provides comments or approvals back to the applicant within ten (10) business days. Step 5: Do you have everything needed to obtain permits and approvals? At this stage, everything should have been submitted for your project. However, if there are any documents or items that may be missing, you will be promptly contacted by the Building Office. If everything is satisfactory, approved permits will be issued. Step 6: Inspections After you have received your approved permit, work is able to be commenced on your project. You will be required to submit requests for inspections a periodic intervals to the City by calling 678-449-3042. Step 7: Certificate of Occupancy Once a final inspection has been completed on your project, a certificate of occupancy will be issued (C.O.) and your project will be considered complete by the City of Douglasville. This means that your business may occupy the location or residents may move in. An Occupational Tax Certification â&#x20AC;&#x201C; commonly referred to as a business license â&#x20AC;&#x201C; is required to conduct business in the City of Douglasville. A business operating without an occupational tax certificate is subject to a legal penalty. The minimum charge for an occupational tax is $50 (admin fee) and varies depending on information such as gross receipts and proof of a state-regulated license. The ordinance has renewals due by January 30th every year. Occupational Tax Certificates are obtained and renewed at City Hall (6695 Church Street). The deadline for renewal is January 30th (1.5% interest after each month and 10% interest after March 31st). If you have more than one location, you may need a separate Occupational Tax Certificate for each business location. If you are operating under various firm or trade names, you will need a separate Occupational tax Certificate for each trade name listed. We strongly encourage businesses to obtain an Occupational Tax Certificate before opening. It is required that non-for-profits obtain an Occupational Tax Certificate: however, no tax is required. If you have a City Occupational Tax Certificate, you do not need to obtain a County Occupational Tax Certificate. Occupational Tax Certificate are transferable only if the certificate holder moves to a new location within the City of Douglasville limits. Please make the City Tax Clerk aware of your location change. There will be a $10 administration fee for your location change. If you have any questions regarding the business licensing process, please contact Douglasville Occupational Tax at (678) 449-3078 or ask-occtax@douglasvillega.gov. The population density in Douglasville is 760% higher than the Georgia average. 32,000+ The population of Douglasvile is 32,000+ and growing! The average age of a Douglasville resident is 33.9 years old. Douglasville is located just 20 minutes from down town Atlanta and Hartsfield Jackson International Airport. MATTERS TO CONSIDER PRIOR TO OPENING How is the circulation and traffic flow in the area? Are there similar businesses in the area? How is waste disposal handled? What source of income will you have through startup? When, where, and how you will market and advertise? Can any of your supplies be purchased from a local vendor or producer? Tax types and payments required by the Georgia Department of Revenue? We strongly encourage local businesses to join the Douglas County Chamber of Commerce for valuable promotions, programs and resources available to new and existing businesses. Have you written a business plan? Connect with the Small Business Development Center (SBDC). Will your new location be in downtown Douglasville? 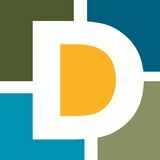 If so, we encourage you to familiarize yourself with the Main Street Douglasville program and the Douglasville Downtown Development Authority. Connect with the programs to see if you qualify for any types of incentives. Do you know where your utilities will come from? Water, Electricity, Gas, etc.? Still have questions? Let us help you!